July is UV Safety Month and protecting yourself from UV rays should be your number one priority while outdoors this summer. This means not only your skin, but your eyes as well! Summer is in full swing and time for fun in the sun is on everyone’s calendar! We all know UV rays are damaging, but did you ever consider how they affect your eyes? Like any other part of your body, your eyes are constantly exposed to harmful UV rays. Since staying home and enjoying the summer from indoors isn’t something most of us want to do, read on for risks and how you can protect yourself and enjoy this summer! Think you’re getting adequate UV protection from your $20.00 sunglasses? There’s a very good chance you’re not. In order to protect your eyes from the sun’s UV and HEV rays, it is important to wear good quality sunglasses that have lenses which will properly block these harmful rays while outdoors. A good quality pair of sunglasses will block 100 percent of UV rays and absorb most HEV rays. It is important to consult with an optician for help in choosing the best sunglass lenses to fit your needs. At Seaview Optical, eye protection and the latest in eye care technology is our specialty. Our board Certified Opticians will thoroughly evaluate you and determine the best lenses that will provide you with the most protection from harmful sun rays. As referenced in allaboutvision.com, there are 3 different types of invisible high-energy UV rays, they are UVA/UVB/UVC and they affect your eyes in different ways. In high short-term doses, UVB rays also can cause photokeratitis, a painful inflammation of the cornea. snow blindness is the common term for severe photokeratitis, which causes temporary vision loss usually lasting 24-48 hours. These have slightly longer wavelengths and lower energy than UVC rays. These rays are filtered partially by the ozone layer, but some still reach the earth’s surface. These are the highest-energy UV rays and potentially could be the most harmful to your eyes and skin. Fortunately, the atmosphere’s ozone layer blocks virtually all UVC rays. But this also means depletion of the ozone layer potentially could allow high-energy UVC rays to reach the earth’s surface and cause serious UV-related health problems. •	Geographic location. UV levels are greater in tropical areas near the earth’s equator. The farther you are from the equator, the smaller your risk. •	Altitude. UV levels are greater at higher altitudes. •	Time of day. UV and HEV levels are greater when the sun is high in the sky, typically from 10 a.m. to 2 p.m.
•	Setting. UV and HEV levels are greater in wide open spaces, especially when highly reflective surfaces are present, like snow and sand. In fact, UV exposure can nearly double when UV rays are reflected from the snow. UV exposure is less likely in urban settings, where tall buildings shade the streets. •	Medications. Certain medications, such as tetracycline, sulfa drugs, birth control pills, diuretics and tranquilizers, can increase your body’s sensitivity to UV and HEV radiation. Surprisingly, cloud cover doesn’t affect UV levels significantly. Your risk of UV exposure can be quite high even on hazy or overcast days. This is because UV is invisible radiation, not visible light, and can penetrate clouds. Since Kids tend to spend a lot of time outside, it is extremely important to protect them as well. •	Not all sunglasses block 100 percent of UV rays. If you’re unsure about the level of UV protection your sunglasses provide, take them to your eye doctor or optician for an evaluation. Many eye care professionals have instruments such as spectrophotometers that can measure the amount of visible light and UV radiation your lenses block. Almost all sunglasses block a portion of HEV rays, but some tints block more blue light than others. Blue-blocking sunglass lenses usually are bronze, copper or reddish-brown in color. •	Remember to wear sunglasses even when you’re in the shade. Although shade reduces your UV and HEV exposure to some degree, your eyes still will be exposed to UV rays reflected from buildings, roadways and other surfaces. •	Sunglasses are important especially in winter, because fresh snow can reflect 80 percent of UV rays, nearly doubling your overall exposure to solar UV radiation. If you ski or snowboard, choosing the right ski goggles is essential for adequate UV protection on the slopes. •	Even if your contact lenses block UV rays, you still need sunglasses. UV-blocking contacts shield only the part of your eye under the lens. UV rays still can damage your conjunctiva and other tissues not covered by the lens. Wearing sunglasses protects these delicate tissues and the skin around your eyes from UV damage. •	If you have dark skin and eyes, you still need to wear sunglasses. Although your dark skin may give you a lower risk of skin cancer from UV radiation, your risk of eye damage from UV and HEV rays is the same as that of someone with fair skin. Sunny days are amazing and made to be enjoyed! You shouldn’t feel scared or discouraged to enjoy them, just make sure you protect your eyes and you’ll be A-okay! Take advantage of the latest technology available in the industry and schedule your appointment now! 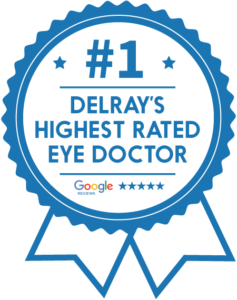 Seaview Optical is conveniently located next to Fresh Market and Zona Fresca in Delray Beach. Corner of Linton and Federal.